Caroline (Danowski) Burchill was born and raised in on an organic vegetable farm near Thorndale – just outside of London, Ontario. The oldest of five children of John & Betty Danowski (Peterson) — what a combination: Polish/Danish heritage! Caroline has a unique voice and sings any song that “moves her soul” – from pop, folk, country, jazz, gospel and showtunes. People have compared her to Anne Murray, Crystal Gayle, Sylvia Tyson, Rita McNeil. Her love of music started at an early age – playing piano at six years old and entering elementary school singing competitions. At 16 she learned the ukulele and guitar and this opened a whole new world of music. She could now play all the songs of the stars she listened to constantly – Gordon Lightfoot, Peter Paul & Mary, Joan Baez, Joni Mitchell. Later on it was stars like Emmylou Harris, Linda Ronstadt and Dolly Parton that made her like country music as well. At 23 Caroline gave up her office job of six years and went on the road coat to coast in Canada playing in lounges, dining rooms and pubs. Different agents booked her as “a solo with her guitar and drum machine.” During that time many original songs were written. After seven years as a solo, she formed a duo with ex-husband Bob Burchill (formerly with Perth County Conspiracy) and called themselves Two Blue. They recorded a CD of originals and cover tunes and toured Western Canada and Ontario. When their son Martin was born, travelling was no longer an option so played in southwestern Ontario, residing in the Mitchell area. During that time she was in a quartette based out of Stratford known as Seraphim and a demo CD was recorded. With the breakup of her marriage, Caroline and Martin moved back to the Thorndale area where she took office jobs in London and raised Martin in the country environment that he was used to. During this time Caroline sang at weddings, churches, private parties, benefit concerts, etc. in the London area. Martin Burchill is also a musician — songwriter, drums and guitar. Currently he is the drummer in a heavy-metal band called Skyless Aeons who have just recorded their first CD and sold out immediately. She then formed another duo with neighbour Jason McLean and called themselves The Neighbours. Jason played keyboard with automatic drums and Caroline on guitar. They had a great sound and played at different venues throughout the London area. Her first CD When the Day is Over was finally recorded on a private label. Each song written came from the heart and has a deep personal meaning. The musicians who performed on this CD are Larry Smith, lead guitar & harmonies, John Vandenberg, bass, Caroline Burchill, acoustic guitar, Dean Harrison, keyboards, Angus Sinclair, keyboards, Bert Hamer, drums, Peter Robertson, violin, Chris Campbell, harmonica, Martin Burchill, percussion, Marilyn Cecile-Smith on harmonies. 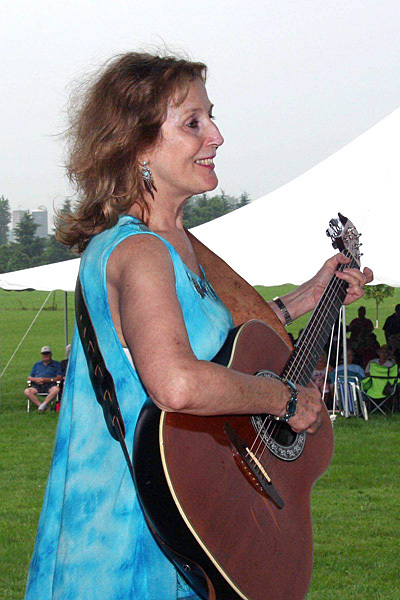 Caroline’s mother Betty co-wrote the title song of the CD. She passed away in December, 2015 and was always so proud of this. Not many 85-year-old mothers could say they had written a song and had it recorded. She was very talented at poetry and song-writing. Such a great loving woman. Caroline resides near the Purple Hill Music Hall in Thorndale and is one of the regular performers at the monthly shows there backed up by the famous Purple Hill Showband. She is known as The Songbird of Purple Hill and has shared the same stage with many great performers who play there — The Good Brothers, Marie Bottrell, George Fox, Carroll Baker, Gordie Tapp, Steve Pitico, Family Brown, Joan Spalding, and others. Because of her love of soft jazz, she also performs on a regular basis with well-known jazz pianist David Priest. Her latest musical adventure is a female duo with Kate Ashby-Craft, a well-known songwriter and recording artist. They call themselves The Honey’s and combine folk and country originals/covers, travelling the folk concert circuit.